I have discovered two absolutely fabulous books explaining Alzheimer's in a very empathetic way to children. The books are not only informative but they are so full of comfort. If Alzheimer's is impacting your family and your kids are confused as to what is happening to a family member - especially a grandparent, these are two books I highly recommend. As I finished reading both of these - I could immediately felt how supportive they will be for children trying to understand a very complicated and frustrating disease. 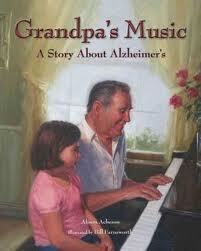 Summary: Grandpa takes care of the garden, kneads bread, and makes music on the piano. Everyone in Callie's family helps out around the house, now that Grandpa, who has Alzheimer's, lives with them. The family becomes Grandpa's "home team," and Callie loves spending time with them. As months go by, Grandpa forgets more, and he can't do as much as he could before. But he can still make music - his fingers remember the notes on the piano. And when he can't recall the words to a favorite old song, Callie helps him come up with new things that they can sing about together. Alison Acheson's thoughtful storytelling and Bill Farnsworth's touching paintings portray a family that learns to adapt to the challenges of Alzheimer's disease while making the very best of their time together. Book Summary: Zach is excited - three weeks of fishing Gramp's lake and eating Gram's cooking. Their first day together is so good, Gramps call it a "Memory Box" day. But Zach isn't prepared, for the story about the memory box. It's a box to save the memories forever; and it's especially for Gramps because he has Alzheimer's disease. 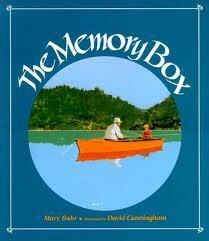 The three of them spend their days together filling the box, with new memories and old. And all three support each other, building strength to handle whatever comes. Thanks so much for sharing these books!!! Having dealt with a mother who passed away this year after years of dealing with Alzheimers issues I am glad to know that there are authors addressing this very timely problem. I will definitely keep these books in mind as great resources.